The rhizome of perennial herbaceous plant anemarrhena asphodeloides of family Liliaceae. Mainly in Hebei, Shanxi provinces of China. Slightly sweet and bitter in taste, sticky feeling when it is chewed. The large, thick and hard one with yellowish white cross section. Unprocessed or processed with salty water. Bitter, sweet, cold; lung, stomach and kidney meridians entered. Clear heat and purge fire (clear the excess heat at qi system and clear the excess heat of lung and stomach), nourish yin and moisten dryness. Being bitter and sweet in flavor and cold in nature, this herb is good for clearing heat and has the actions of moistening and clearing heat and purging fire by entering lung and stomach meridians. It works the same as Shi Gao in the light of clearing excess heat at qi system. As a common used herb for treating the hyperactivity of pathogenic heat manifested as the lingering high fever, sweat, irritability and thirst, with surging and big pulse, Zhi Mu is often combined with Shi Gao for mutual reinforcement. For instance, Shi Gao and Zhi Mu are combined for mutual reinforcement in Bai Hu Tang from Shang Han Lun. For Zhi Mu has the actions of nourishing stomach yin and generating fluids to quench the thirst, it is used to treat thirst and over drinking caused by exuberant heat consuming clear fluids. It can clear lung heat and nourish lung yin to remove lung dryness and is indicated for cough syndrome caused by lung heat or for dry cough caused by yin deficiency. For lung-heat cough with sticky yellow sputum, or dyspnea caused by adverse flowing of lung qi due to accumulated lung heat, it is combined with heat-clearing and phlegm-resolving herbs to stop cough and dyspnea. Therefore, in Zhi Shi Xie Bai San from Zheng Yin Mai Zhi (Treating Symptoms Based on Pulse), Zhi Mu is combined with Sang Bai Pi and Di Gu Pi. For dry cough with little sputum caused by deficiency of lung yin and internal heat, it is combined with yin-nourishing and dryness-moistening herbs. In Er Dong Er Mu Tang from Zheng Yin Mai Zhi, it is combined with Bei Mu and Mai Dong, etc. It can clear stomach fire, keep clear fluids and nourish stomach yin while generating fluids to quench the thirst and it is indicated for thirst syndrome with fluids consumption no matter it is caused by blazing of stomach fire or dry heat due to yin deficiency. For thirst with restlessness due to blazing of stomach fire consuming fluids, it is combined with stomach-heat-clearing herbs and fluids-generating herbs. For instance, it is usually combined with Shi Gao, Shu Di and Mai Dong, etc. , in Yu Nv Jian from Jing Yue Quan Shu. For dry thirst due to yin deficiency with heat, it is combined with yin-nourishing and fluids-generating herbs like Sheng Di, Mai Dong. It can also be used for treating headache, swollen throat, painful and swollen gum caused by stomach heat or constipation due to intestinal dryness. For it has actions of nourishing stomach and yin, it is also indicated for diabetes, but often combined with qi-tonifying, yin-nourishing, fluids-generating herbs. For instance, it is usually combined with Shan Yao, Huang Qi in Yu Ye Tang from Yi Xue Zhong Zhong Can Xi Lu (Records of Traditional and Western Medicine in Combination). 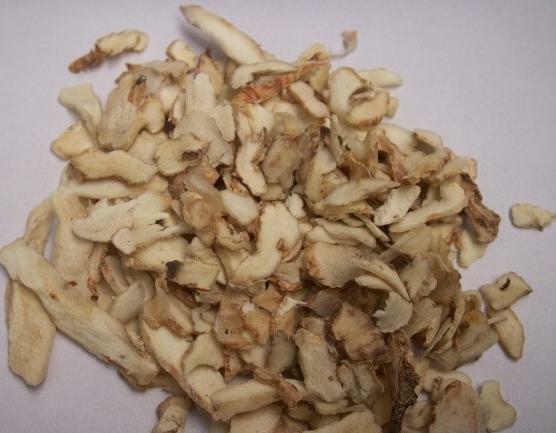 It can nourish kidney yin and withdraw deficiency heat, and purge ministerial fire. For kidney yin deficiency with deficiency fire internally generated manifested as tidal fever, irritability due to deficiency, night sweat, spermorrhea, etc. 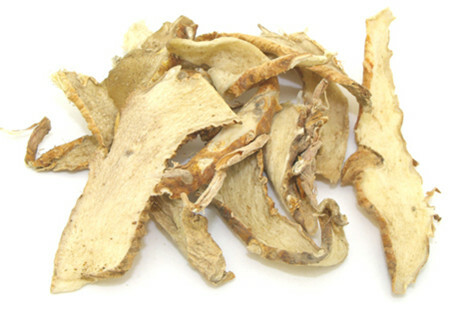 , it should be combined with herbs for nourishing kidney yin and removing fire. For instance, it is combined with Shu Di Huang and Huang Bai in Zhi Bai Di Huang Wan from Yi Zong Jin Jian. Decoct 5~15 g and take it orally. It is not suitable for deficiency cold syndrome. Being cold and moist in property, it is prohibited to be used for those who have a spleen-deficiency diarrhea.